Article by Bill Kerr. Reprinted with permission from his blog. The Daesh (aka ISIS, ISIL) is the monster created within the monster of Assad’s Syria. The Syrian cartoonist, Raed Fares, survived a Daesh assassination attempt in January 2014… the would-be assassins fired at Fares 46 times. Twenty-seven bullets struck the wall behind him; 17 hit his car. Only two struck him. They shattered seven bones in his shoulder and ribs and punctured his right lung. Assad’s brutality in the face of the Arab Spring inspired Syrian revolution has created 200,000 plus deaths and 3.5 million refugees. Today we witness so much grief and preparation for terrorism at “home”. By contrast there is little understanding and commitment of what needs to be done in Syria. “Three years ago, America could have saved thousands of lives,” Bayyoush went on. 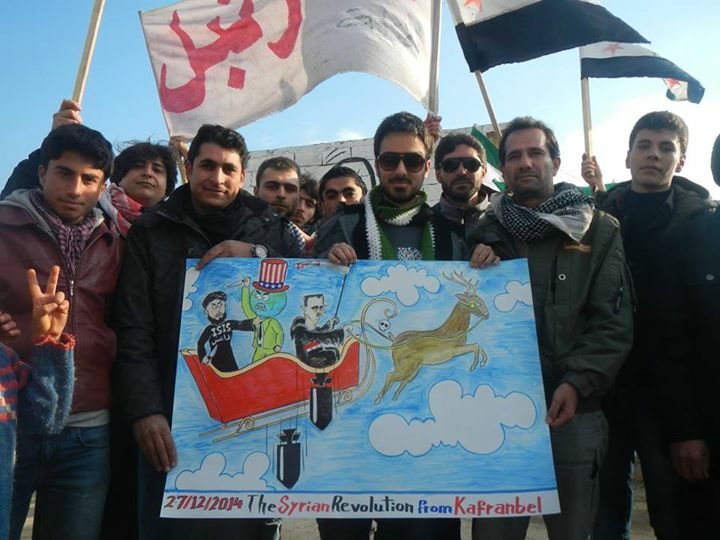 To them, what they needed seemed simple in hindsight: antiaircraft missiles, airstrikes against Assad, a no-fly zone. All of these options would have offered potential solutions. Their model for U.S. intervention was Libya, where airstrikes in support of the opposition helped to depose Qaddafi. Later the country descended into civil war. Fares acknowledged that Libya was hardly a success story, yet at least, he said, the United States had intervened to protect the Libyan people. In Syria, Assad was free to systematically imprison and kill the moderate leaders the United States was now looking for. “One by one, they were disappeared,” he said. The recent strikes against ISIS in Syria frustrated the Free Syrian Army commanders on two counts. First, unlike that of the United States, the F.S.A.’s primary foe was the regime. “The regime has launched chemical attacks and many more massacres than ISIS has,” Bayyoush said. Second, they had been warning the United States against the growth of ISIS for more than a year. “A year and a half ago, ISIS started activating cells,” Hamada said. “If America had helped us in the beginning, there would be no ISIS.” But the growth of ISIS wasn’t simply America’s fault. The Free Syrian Army bore its own responsibility. “These extremist groups formed because we were weak within the Free Syrian Army,” he said. Some more Raed Fares cartoons, they are all located in one place here, Liberated Kafranbel .